Luggie Mobility Scooter have been promoting and selling the Luggie since its launch in 2009. We have offices and a showroom in Lancashire, along with travelling representatives who cover the entire United Kingdom. We are proud of our extensive customer care and always ensure you receive an unrivalled service. We also offer 24hr breakdown cover, insurance and extended warranties, giving you complete peace of mind. Along with this, we are registered members of the British Healthcare Trades Association, whose code of conduct is approved by the Government's Trading Standards. We offer a wide range of scooters and mobility scooter accessories. We pride ourselves on offering only the best lightweight mobility scooters and travel mobility scooters. If you're looking at portable mobility scooters, or it's a folding mobility scooter you're after, then we can certainly help you. Luggie Scooters is a trading name of local Mobility UK, which is part of the UK Mobility Group. We have been chosen by Freerider to promote this special product due to our history of excellent customer service and track record retailing the scooter. 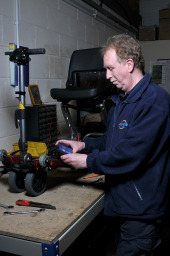 What's more, your demonstration of one of our lightweight mobility scooters will be carried out by a member of our expert and friendly team, who will be more than happy to answer any questions and queries you may have. The Luggie is the original one piece folding mobility scooter. There have been over 20,000 units sold globally since the product was launched and is the winner of the Taiwan Excellence Gold Award 2011 for innovation and quality. Here at Luggie, we are passionate about our product and the difference it can make to our client's lives. Why not come and visit us and see just how we can help you? We have thousands of happy customers to date and look forward to thousands more. Allan has received fantastic reviews from our customers and favours the Black Elite Luggie. Keith has been demonstrating the Luggie for over 5 years his favourite accessory is the off board charger. 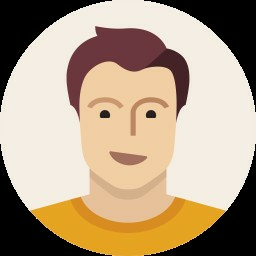 Paul works in head office in Leigh, generally in charge of marketing but will often be on the end of the phone helping customers. 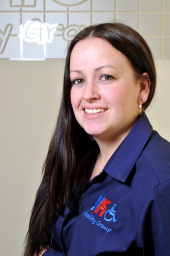 Paula spends her time booking in home demonstrations and answering any enquiries. 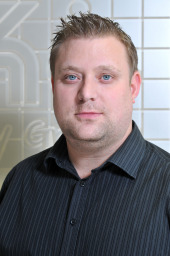 Shaun is the newest member of the Luggie team. He demonstrates the scooter on the road and also live on Ideal World! Monika books in your home demonstrations and helps with any questions you may have.